I’ve never used iDVD before on account of not having a SuperDrive equipped Mac. Apple saw fit not to include it as an option for over the counter 12" iBook, but iDVD in the iLife ’06 package allows you to use any DVD writer available. This is about time as the only other options available to you were to use DVD Studio or Toast. So as a newbie to iDVD how is the program? Well it is pretty much in synch with the rest of the iLife package…Simple, straight forward and pretty much drag and drop. One of the major changes with this version (which you notice when starting a new project) is the option to create a standard or widescreen DVD. Whilst iDVD 5 claimed that you could do widescreen, it wasn’t really true and produced unexpected results. The interface has many similarities to the new iMovie HD 6 (reviewed previously), which is good because it means you’re not having to relearn each time you switch between apps. The terms used for the sections are very similar also, with terms like ‘Themes’, ‘Menu’, ‘Buttons’ and ‘Media’. ‘Menu’ and ‘Buttons’ allow you to add different entries to the menu or add nice looking buttons as navigation aids. While this seems nice it can be a pain if you’re using themes as everything is bound to specific areas. You have to choose the buttons wisely. As with the new themes in iMovie HD 6, these themes are copied across into iDVD, making it incredibly easy to have a consistent design right across your project. Many of the new themes (like in iMovie HD 6) have multiple parts to them, so your main splash screen can now look quite different to your chapter selection screen for example. 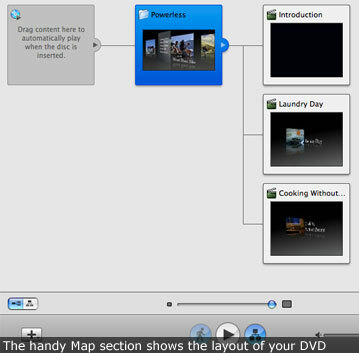 A seriously cool tool is the DVD Map, which I understand has been enhanced from previous versions. This allows you to see the project in much the same way as using a flow chart, including allowing you to see broken links as how the DVD is laid out. It also gives you access to the ‘Auto Start’ section of your DVD…a place where you can drop movies to get them to play on startup. This is very handy if you want to include your company logo and animation to start the DVD, or if you want to make the DVD an ‘auto-run’ DVD that plays straight away. This map area also indicates the ability to have sub-menus. A ‘+’ button at the bottom toolbar opens a drop-down menu allowing you to add sub-menus, slideshows, and movie files to your project. These can all be done back on the more traditional front section of the DVD, but it is up to you whether you want to work from the main area of iDVD or from within the map area. Cutting the DVD is an interesting affair…talk about taking a long time! On my iBook 12" with 768Mb RAM it took something like 3 hours to create. This involved encoding the movies, creating the menus, and then creating the DVD, although like the previous version, at least you get an indication as to what the program is working on getting ready for the burn. Here’s where things got a little interesting for me as the burn failed on my machine. I’m not sure why but I have a theory. For a start my DVD writer is not a SuperDrive. As such iDVD burns to a temporary image and then to the DVD (this makes sense), so it could be something in the way in which iDVD writes to non-SuperDrives. The other possibility is because I was using DVD-R. These are the most compatible discs as these are used by pretty much every DVD player on the market. However they are also the most likely candidates for coaster makers. I did find a way that seems to work. Save the project as a Disc Image then use Disk Utility to cut to external DVD. This burned properly and uses less memory, which might be the third reason why the burn failed before. The results are immaculate though. The DVD menus look gorgeous with the new 6.0 themes and the map view is a great way to check the layout for any errors. All in all, iDVD 6 is a simple to use but a very slick tool…and a perfect complement to iMovie and iPhoto. It uses a lot of memory and processing but the results are worth it. Now your family doesn’t have to put up with boring looking DVDs of your home movies. Darryn’s problem with burning a DVD is one I am asked about a lot. I find the most successful burns occur with blank DVD media that are exactly the same specifications as your DVD writer. So, if you know your DVD writer can only burn ‘-R’ discs, this may not be enough. What speed does your DVD drive burn at? If it is a 2-speed burn, I strongly recommend you trying to find DVD-R discs (and good quality ones at that!) that are exactly listed as being ’2x’ discs (or maybe ’1x-2x’)…..not something more general as ’1x to 4x’ discs or ones that often simply have no speed indication or state "works art all speeds". Finding discs like this isn’t always easy to do, but shop around. I have not been impressed by cheap brands and have also found that when you buy discs that are as close to a match as your DVD burner’s specifications, the chances of a successful burn are much, much better.